(jazz/funk) This group has had a Tuesday residency for months and starting this week is moving to every Monday. 8pm Free. (Singer/Songwriter/Soul) Doug Wamble’s new album goes on sale everywhere Tuesday. Its an amazing record that I’m extremely proud to have been a small part of. Download it on iTunes, Amazon, etc, etc. CD Release show will be May 15th @ Joe’s Pub! (Jazz) BUNKY GREEN never comes to New York. Please please please, do not miss this. 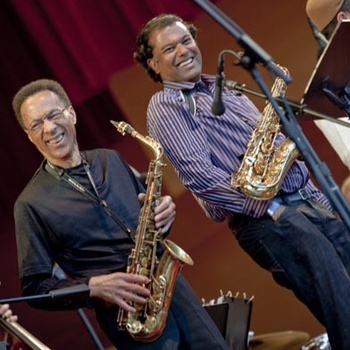 Featuring – Rudresh Mahanthappa – alto saxophone Bunky Green – alto saxophone Jason Moran – piano Francois Moutin – bass Damion Reid – drums. Free download of a live track at http://rudreshm.bandcamp.com 7:30pm and 9:30pm both nights. $25 $5 off with student ID. (Jazz) One of the giants of the tenor saxophone. Featuring the great Adam Cruz on drums. 9:30 Friday 10:30 Saturday. $20 for all night includes one drink. Posted on Monday, April 19th, 2010 at 6:35 pm. Filed under: Blog, NYC Concert Recommendations	RSS 2.0 feed.